WHAT MAKES TRINFINITY8 DIFFERENT FROM OTHER BIO-ENERGETIC DEVICES? A Quantum Interface to Magnify User Intent – Dr. Kathy Forti, who helped develop Trinfinity8, brought this information back from a near death experience she had in 2003. This energy, knowledge, and intent was suffused into all aspects of Trinfinity8. 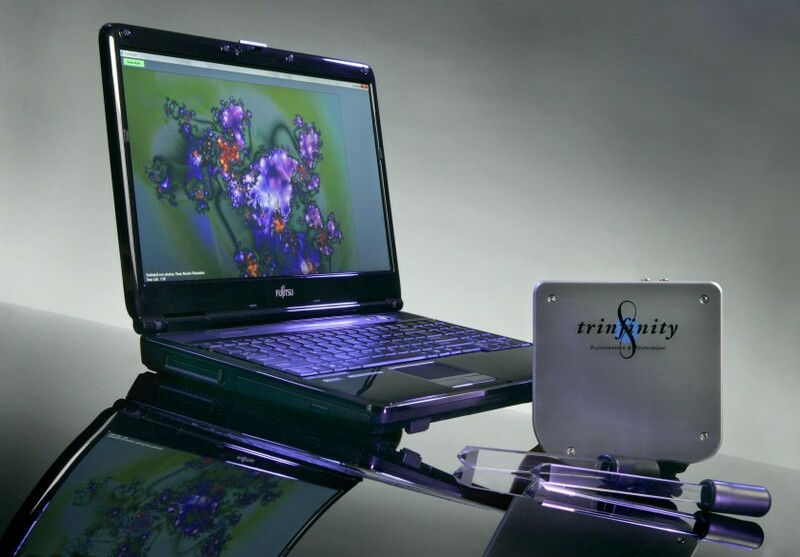 Mathematical Binary Substance Coding – Trinfinity8 uses computer processing speed to transmit mathematical code sequencing to the body, much like your DNA. Billions of binary codes contain the higher vibrations of all rejuvenating substances. A Fractal Amplification Resonator – Quantum physicists are discovering that enlightenment is the charge you attract when your thought patterns get fractal. (A fractal is a geometric shape that can be split into billions of parts, yet each part contains an exact replica of the whole.) The Science of Fractals allows phase conjugation and a unified field for waves or people. Holy men call this ONENESS. Trinfinity8 technology allows fractal fields to bond and become one with the rejuvenation formulas encoded within the program. This serves to positively strengthen and amplify the information coming through to the user with infinite multiplicity. Sacred Geometry Infusion – Ancient mathematical formulas that encompasss all of nature have been interwoven into the matrix of Trinfinity8. Pure Solfeggio Sound Tones & Harmonic Crystal Tuning – Research shows that these ancient tones have the capacity to assist regeneration and transformation, and activate DNA. These pure sacred tones have been used since ancient times to awaken a natural expansion of consciousness. In Trinfinity8, the tones act as a carrier wave to further strengthen the transmission of data to the cellular system. Rapid Quartz Crystal Rod Transmission – Flawless double-terminated quartz crystal rods transmit the healing codes through the nerves, meridians, and minor chakras of your hands, flooding your system with streams of rejuvenating information. Trinfinity8 users are not only extolling the rejuvenating physical effects of using Trinfinity8, but also awakening to the spiritual vibrational changes it also brings about. On the spiritual level, Trinfinity8 is encoded with what can best be described as ascension coding, frequency patterns which help accelerate evolution and spirituality by directing DNA activation to its highest potential. Trinfinity8 is the quintessential holistic tool for high level wellness in the 21st Century.